#2 MIAMI 54, VIRGINIA 50 - Virginia has been suffering some defensive lapses of late, but none worse than forgetting to guard 6’10” 292 lbs. center Reggie Johnson. Left alone, Johnson made a tie-breaking layup with 5.7 seconds left and the No. 2-ranked Miami Hurricanes overcame a ragged offensive performance for the second game in a row to beat Virginia. The Canes remain unbeaten in the ACC. Durand Scott added two clinching free throws with four seconds to go for the Hurricanes, who earned their 14th consecutive victory. The win came two nights after they rallied late to beat Clemson 45-43. The Hurricanes (22-3, 13-0 ACC) improved to 12-0 at home. They hold a 3 1/2-game edge over second-place Duke in the ACC as they chase their first league basketball championship. Virginia (18-8, 8-5) fell to 0-6 in Miami. The Cavaliers led only once, at 29-28, but Evan Nolte tied the game at 50 by sinking a 3-pointer with 15 seconds left. NORTH CAROLINA 70, GEORGIA TECH 58 - James Michael McAdoo scored 22 points and grabbed 11 rebounds to end a three-game scoring slump and North Carolina took control with a 12-0 second-half run to beat Georgia Tech on Tuesday night. The sophomore forward was sharp against the Yellow Jackets. He had 15 points in the first half and scored the final basket in the 12-0 run that gave North Carolina (18-8, 8-5 ACC) a 59-41 lead with 8:47 remaining. The Tar Heels stretched the lead to 22 points at 66-44. 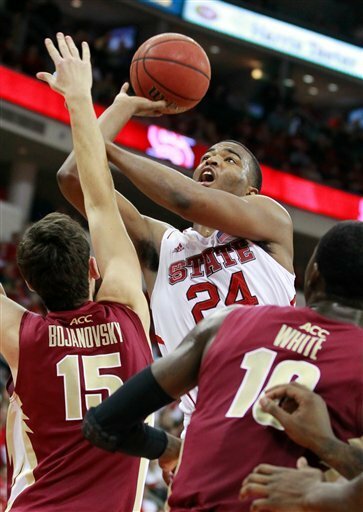 N.C. STATE 84, FLORIDA STATE 66 - Freshman T.J. Warren, making his third start in NC State's last six games, had career highs in points and rebounds to lead the Wolfpack to a victory over Florida State on Tuesday night at PNC Arena. C.J. Leslie added 19 points for the Wolfpack (19-7, 8-5 Atlantic Coast Conference), who led the entire night to snap a three-game losing streak against the Seminoles. The win also snapped a four-game losing skid against Florida State (14-12, 6-7) on N.C. State's homecourt in Raleigh. The Wolfpack dominated the boards and got plenty of second-chance baskets to stay in control of this one, earning a third straight win overall heading into this weekend's trip to rival North Carolina. Michael Snaer scored 20 to lead the Seminoles, who have lost three of four since beating Georgia Tech on his last-second basket two weeks ago. Warren, a 6-foot-8 forward, earned just his fifth start. He finished 12-for-15 from the field and hit two 3-pointers in 31 minutes. BOSTON COLLEGE 69, MARYLAND 58 - After beating Duke on Saturday, the Terps looked poised to make a run at returning to the NCAA Tournament. That lasted all of three days as Freshman Olivier Hanlan scored a career-high 26 points to lead Boston College past Maryland, at Conte Forum on Tuesday night. The Eagles (12-14, 4-9) used two separate 17-5 runs in the second half to pull away from the Terps (18-8, 6-7) after trailing 33-26 at the half. BC went 16-for-16 from the line in the last 5:04 and made 21 of 22 from the stripe overall. It was the best performance from the charity stripe since 2004. Over a nine-plus minute stretch in the second half, Hanlan scored 14 of BC's 22 points and made all of the Eagles' five field goals. Hanlan shot 9 of 14 from the floor and grabbed seven rebounds. Sophomore Eddie Odio recorded career highs with 11 rebounds and six blocks to go with eight points. Classmate Lonnie Jackson scored 13 points.